Once upon a time, in 2011, I wrote an intriguing story about a mystical music box which seated in the Oval office for nearly 200 years and recorded every conversation there. It’s a story I had in me for nearly three years at that time. I was trying to push an initiative I called ‘US&A’, which was my reinvention of the Marvel Universe in the exact same order Stan&Jack had done it. Except it was creator owned. So, in this project, I had my FF, my Spider-Man, my Hulk and… Black Box, which was supposed to top all series and give consistency to the whole thing. As often, things didn’t go as planned. I went to the San Diego Comic Con in 2010 with the goal to get feedback on my idea. I had the chance to meet one of the most respected guy in comics, Hank Kanalz. Hank, now a Senior VP at Vertigo/DC Comics was kind enough to tell me what he thought about it. And his verdict was clear: “Black Box has the most potential and has to be done first”. At that time, Black Box was just a rough pitch. My other projects in the line were far more advances, especially one, The Unbreakables, which was my take on the Fantastic Four. It was a very dark story set in World War II with a family that had been experimented on and who was executing rogue missions for the American government with the hope to be killed because they were all suffering from becoming monsters. French artist Cyril Pontet did wonderful designs for that project that never went anywhere, unfortunately. At that time, period comics were not really hot. So the retro feel of the Unbreakables wasn’t really met with lots of enthusiasm, to say the least. When I came back from SDCC, Moïse Kissous, head of French publisher Jungle Comics, offered me to join him in launching a new line of comics, both licensed and original. He heard me talking about Black Box and requested that I wrote an elaborated pitch for it. That’s what I did. And the project was greenlit for the upcoming Atlantic BD line that Moïse was cooking up next to Jungle Comics. Enter Tom Lyle. Some connections are really strange but sweet. In 2009-2010, I don’t really remember exactly, I was brought into a comic book project called IT Heroes. It was funded by a tech company. The project has been supervised by two former DC guys, Jordan ‘Gorf’ Gorfinkiel and Robert Greenberger. They wanted to use French artists for the task but didn’t know any. So I helped with my connections. And Robert remembered that. Tom has been teaching at SCAD (Savannah College of Art and Design) since 2005. SCAD is a big deal down there. And internationally too. They have some facility in Hong Kong and … In the south of France. Near Avignon, there’s a village named Lacoste, which SCAD helped develop and maintain a great deal, where the artists-students can come for 3-6 months for a residency. While there, the students come to Paris and visit many places with ties to the comic book industry/history. Tom was looking for someone in Paris to help him get professionals to talk to his students. Robert whispered my name, and there was I.
Tom and I quickly became friends. I loved his attitude. And at the time, he’d been away from the comic book industry for a while. I don’t remember precisely how I pitched Black Box to him, but he immediately said he was interested in having a chance to show what he could do. I said “alright”. We did some tests. The publisher liked them enough to grant us a deal. And we started working on the series. Due to the French album format and the time we had (a few months only), we had to make some choices. Tom, being away from the industry for a long time, wasn’t really comfortable with the full script mode. He was more of a “Marvel style” guy (where the artist works from a plot and then the dialogue is added afterwards. So we kinda met halfway. 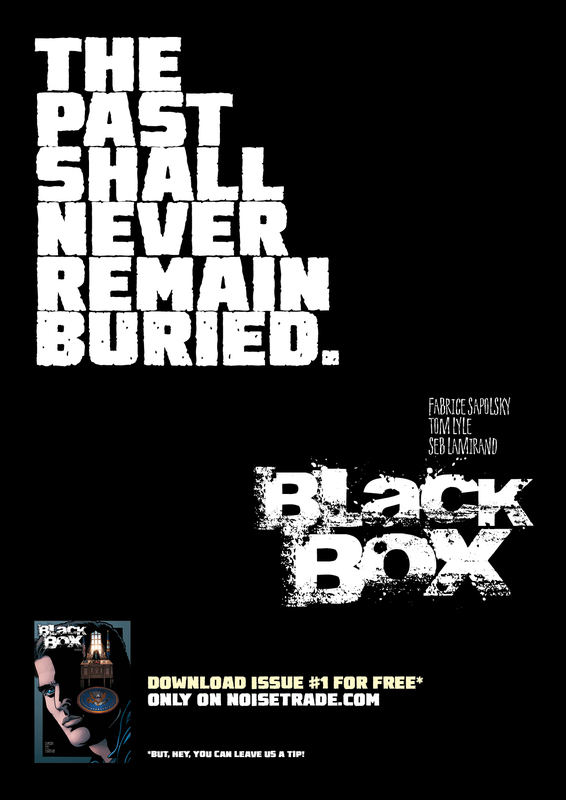 With the help of superior color artist Seb Lamirand, we completed Black Box in 3 months. 67 pages. That represent 3 american issues. Black Box was released on September 2011 and was met with mixed reviews. Some people really liked it. Some other thought it wasn’t good enough. Black Box has its flaws. I know them. But I’m still proud of the work we did with Tom and Seb. And I’m happy that Atlantic BD gave us our rights back so we could make the book available in english for the first time. We chose to offer Black Box, as separate issues, through Noisetrade. A service where you can download content for free and leave a tip for the creators.